If you're in a group, solo, a duet or even 10+ members we want you involved all dance styles welcome all music genres welcome we want your creativity on what is going on around us daily! Have to be at experienced intermediate /advanced level. 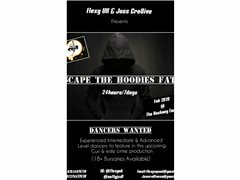 We are looking for versatile dancers with a professional attitude and work ethic. The ability to contribute creative ideas would also be a bonus. And most importantly the ability to attend at least one regular weekly rehearsal.